Illuminated Manuscript of Five Poems (Quintet), Walters Art Museum Ms. W.605, fol. 88b, originally uploaded by Walters Art Museum Illuminated Manuscripts. An elegant copy of the "Quintet" (Khamsah) of Niẓāmī Ganjavī (d.605 AH / 1209 CE) penned by Abū Bakr Shāh ibn Ḥasan ibn ʿAlī al-Shahrastānī and illuminated by Jamāl al-Dīn ibn Muḥammad al-Ṣiddīqī al-Iṣfahānī between 892 AH / 1486 CE and 900 AH / 1494-05 CE. The present codex, opening with a double-page decoration and the inscription giving the name of the author and the title of the work,contains four additional illuminated headpieces with the names of the individual books and 26 repainted miniatures. 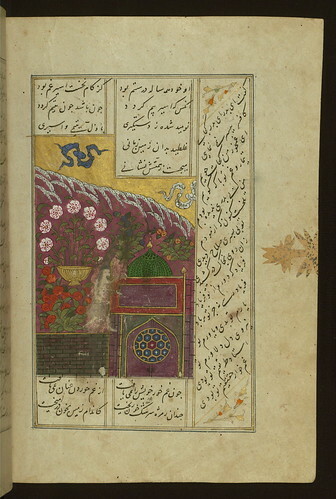 The page depicts Manūn visiting his father’s tomb.